A couple people have let me know that the Stop Spammer Registration plug-in was blocking them from logging in. If you have also been unable to login, I have disabled this self-described aggressive spam plugin that is supposed to prevent spam registrations, logins and comments. It had been working beautifully, but in the last few days has become, perhaps, a little too aggressive for us. Anyone with an account should be able to login now. The driving force for moving from Blogger to our own site a couple years ago was the limitation that blogger has for the number of authors on group blogs. Moving here (and learning WordPress) removed that limitation, but introduced a new problem–spam registrations. As you all might remember, when you first signed up for an account, it has no privileges and so those spam accounts have no ability to DO anything, except to clog up the list and become a housecleaning task for me. I have been using the Stop Spammer Registrations plug-in for a while and it really helped … until recently. I have replaced it with something that provides more checks and balances during the registration process. 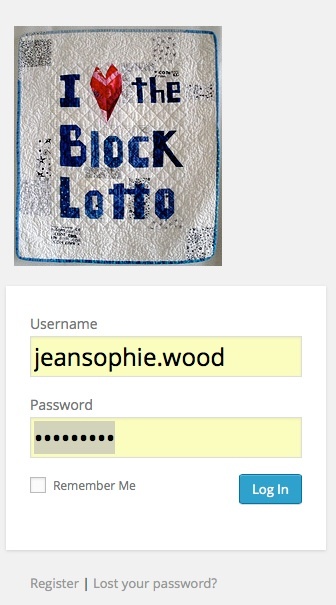 It shouldn’t affect logging in, except for a little customization of the login page–the WordPress logo has been replaced with some Block Lotto imagery. Thanks Sophie! You take such good care of us!